Arun Jaitley recalled that Nandan Nilekani gave a "forceful and persuasive" presentation to Prime Minister Narendra Modi, who decided to go ahead with it, soon after the NDA government came to power. Arun Jaitley was speaking at the launch of a book on Aadhaar in New Delhi. New Delhi: Union Finance Minister Arun Jaitley today alleged that the previous UPA regime had divergent views on Aadhaar and the Congress-led government changed its position to oppose the legislation after assuming the role of Opposition in Parliament. Also, the initial legislation related to Aadhaar during the UPA regime was a "bald" one, Mr Jaitley said. The finance minister recalled that Nandan Nilekani gave a "forceful and persuasive" presentation to Prime Minister Narendra Modi, who decided to go ahead with it, soon after the NDA government came to power. However, he said, when the Act was reworked by the present government, "one thing which was clear that the privacy provisions were required". "...the UPA government had two clear schools of thought. One which was not enthused by Aadhaar at all and therefore raised issues... relating to national security. And the other (school of thought) which was pushing it. As a result, (it) was a very bald legislation," said Mr Jaitley. He further said that when the present government decided to go ahead with Aadhaar, the UPA, now in Opposition, almost made it clear that they were opposed to this idea. On Congress' stance on the legislation, the finance minister remarked, "Where do you stand now literally depends upon where you sit in the House." 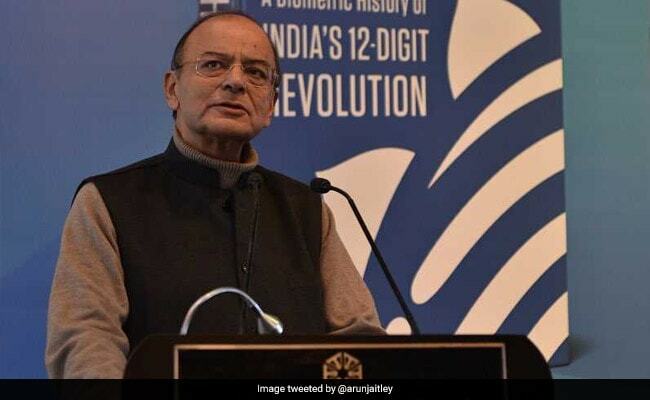 Mr Jaitley was speaking at the launch of a book 'Aadhaar: A Biometric History of India's 12-Digit Revolution' written by Shankkar Aiyar in Delhi.